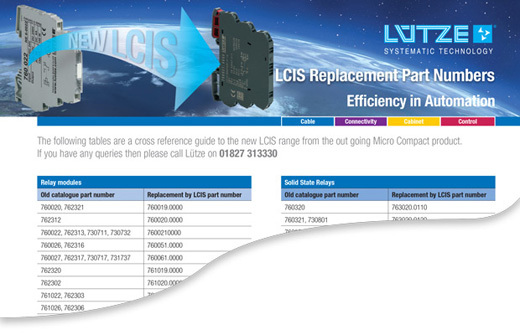 Lutze are replacing the popular Micro Compact products with the new LCIS (Lutze Compact Interface Solutions) range. With a number of improvements (including lower, more competitive prices), it's a great opportunity to start using the new units. 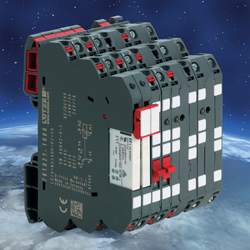 The LCIS series offers compact, innovative terminal block style relays, signal convertors and isolators for a wide range of industrial applications. With an installation height of just 73mm, LCIS units are ideal for DIN rail mounting in compact, low depth distribution enclosures - you can find them on page 149 in our 2018/19 product catalogue. If you are one of the many customers who are used to ordering the existing Micro Compact units, we have a LCIS Cross Reference Guide available to download. Simply find the item you usually order and the guide will give the LCIS alternative. It couldn't be easier. You can use the LCIS part number to place your order by phone and e-mail, or use it to search the LC Automation website and buy online! Lutze suppy a wide range of cables and connectors, power supplies, control gear and circuit protection products which you will find in our new 2016/17 product catalogue and are available to buy online. If you would like to discuss your requirements or need to ask a question about any Lutze product, please give us a call on 01254 685900 and our Sales Team or Technical Support Engineers will be happy to help.